When we think of what we should be eating on phentermine in order to lose weight, we think of deprivation and restricting ourselves to save calories. However, skipping meals or not eating regularly enough to sustain yourself leads to mindless snacking and bad choices when you do come to eat, due to being over-hungry. It’s these kind of bad eating habits that lead to a sluggish metabolism, low energy levels, bingeing, and subsequently, weight gain. So, here we have some great snack ideas for you to incorporate into your phentermine food plan and to ensure that you don’t get caught out by cravings. Not only is this a great breakfast option, but it’s a perfect snack to satisfy you if you’re at home and in need of something to keep hunger at bay. This snack is full of dietary fiber, whole grains, protein and many vitamins such as fat-burning choline and essential B vitamins to give you a health boost while also helping to suppress appetite. Walnuts, almonds, peanuts, or Brazil nuts are all great choices, and why not add some goji berries, raisins or a teaspoon of plain chocolate chips to add some sweetness to the mix? You can easily prepare this on a Sunday and divide everything up into small zip lock bags to snack on at work, then you won’t be able to eat more than the amount you’ve allotted for yourself that day. Nuts are rich sources of essential weight-loss vitamins, and Brazil nuts in particular contain the mood-boosting nutrient selenium, also found in Phen Vites to help counteract the psychological side effects of phentermine. Top five whole grain crackers with a thin slice of avocado each for a creamy crunchy treat, which totals 150 calories. When it comes to eating on phentermine, this snack is perfect; avocados are a great source of heart-healthy monounsaturated fats, and the fiber and fat content of this snack will keep you full and help curb hunger pangs. The fiber, water and antioxidants in fruit and vegetables make them great snacks, but by combining your apple with some low fat cheese, you also keep yourself sustained for longer with protein and a little fat, while also giving your taste buds some variety with the satisfying smooth-meets-crunchy snack. Dip a cupful of sliced yellow, red and green bell peppers into 3 tbsp. hummus and keep yourself satisfied until your next meal. Sweet and crunchy bell peppers in a rainbow of colors provide lots of vitamins A and C, a good amount of fiber, and special heat-generating substances which fire up your metabolism for around 20 minutes after eating them. Hummus is a great source of fiber and protein, plus, like turkey, it contains tryptophan, which will help you feel calm and manage stress levels so it’s a great option to be eating on phentermine as a way to combat a range of phentermine side effects such as depression, anxiety and mood swings. There’s been an influx of social media photos of celebs and bloggers with green smoothies lately, but if you’re wondering how to enjoy the health benefits without having to swallow grass-flavored sludge then this recipe is for you! Blast kale leaves, a few slices of cucumber, a kiwi, half an apple and a handful of unsalted sunflower seeds in a blender and enjoy the fresh taste of this fruit and veg mix while also benefiting from a host of weight-loss-boosting nutrients. Wrap two ounces of thin turkey and a thin slice of provolone cheese in a large romaine lettuce leaf. This protein-rich wrap with added vitamins and calcium tastes great and will satisfy your hunger, plus turkey is high in the anxiety-reducing amino acid tryptophan, so you can relieve stress at the same time. Try to use sodium-reduced turkey slices in order to keep your sodium intake low. This type of snack is great to keep you satisfied when dinner is a long way off. This combination isn’t just filling, it also gives you lots of nutrients such as potassium, lycopene and beta-carotene. If you’re worried about the salt content of tinned soups, pour away a quarter of the soup and dilute it with water. Swirl a teaspoon of peanut butter into your Greek yogurt for a healthy snack which will feel oh so indulgent. As well as being tasty, this snack provides a ton of protein to keep you feeling satisfied, plus healthy unsaturated fats and essential weight-loss nutrients like vitamin E. The key is to make sure that the Greek yogurt is unsweetened and low fat if possible, and that the peanut butter is a natural brand which just lists peanuts and salt as ingredients. If not, regular is better than low fat options of peanut butter which are actually loaded with extra sugar to compensate for the lack of healthy fats. These are just a few great snack ideas to help you establish new healthier ways of eating on phentermine, satisfying your hunger while also boosting your energy levels, keeping your blood sugar levels constant and helping your metabolism to work efficiently. Plus, the delicious flavor combinations will mean your taste buds won’t feel deprived, either! However, if you feel that your phentermine has stopped working and that you’re still hungry even with regular healthy snacks, then the leading phentermine alternative, Phen Caps, can help. 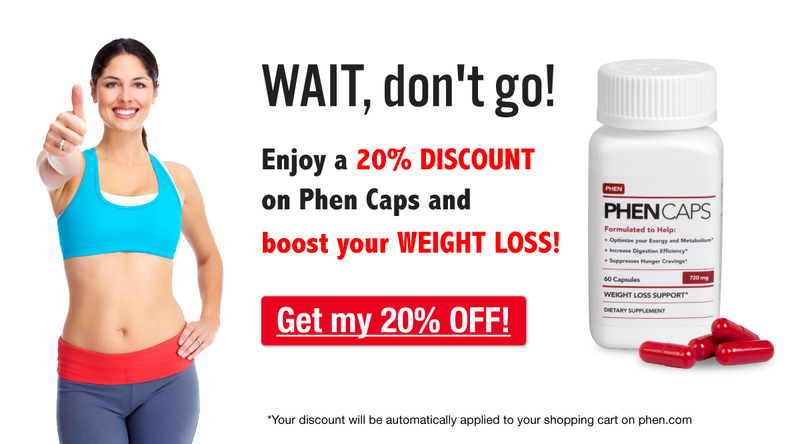 With their combination of active ingredients, Phen Caps boost energy and suppress appetite while also helping to boost metabolism and burn fat, meaning that long term weight loss success is even more achievable. Do you have any healthy snack ideas? Let us know by commenting below!